2 ultimate beef burgers made with minced British beef, simply seasoned with sea salt and black pepper. 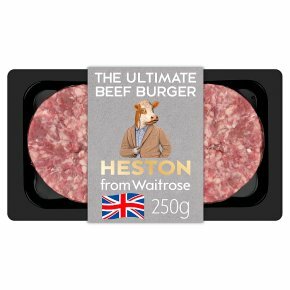 A blend of three cuts of British beef, carefully minced to keep the grain running in the same direction for a tender, melt in the mouth experience. INGREDIENTS: British beef (96%), rehydrated potato, rice flour, sea salt, salt, black pepper, preservative sodium sulphite, maize dextrose, antioxidant sodium ascorbate. Grill Time: 12-14 mins. Grilling Instructions: Preheat grill. Place on grill rack under a medium to high heat. Turn occasionally until thoroughly cooked, the juices run clear and there is no pink meat. Pan Fry. Time: 10-14 mins. Heat 1 tsp of oil in a frying pan. Place burgers into the pan. Turn occasionally until thoroughly cooked, the juices run clear and there is no pink meat.